Äs Nödt is a Quincy and a member of the Wandenreich's Stern Ritter with the designation "F". Äs has long, dark hair and dark eyes with visibly light pupils. Its attire is a variation of the Stern Ritter's typical white uniform, consisting of the order's signature hooded cloak and a knee-length trench coat, as well as black boots. Äs also wears a dark mask that obscures the lower half of its face and features five, later four spikes running down its center. Upon receiving the orders of the Wandenreich Leader, Äs and the other Stern Ritter gather at the Gate of the Sun, before traveling to Seireitei in order to participate in the conquest of Soul Society. Once there, Äs and the other Stern Ritter create pillars of blue flame prior to engaging the Shinigami in battle. Indiscriminately massacring numerous lower-ranking Shinigami, who are unable to injure it, Äs is soon intercepted by lieutenant Renji Abarai. Äs proceeds to effortlessly block Renji's strikes with its bare hands, until they are interrupted in turn by the arrival of another Stern Ritter and Captain Byakuya Kuchiki. 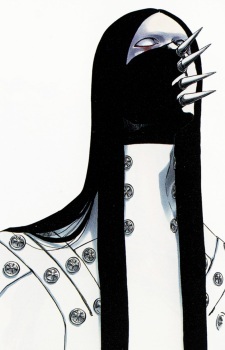 When its hand is later severely cut by Byakuya, Äs is berated by its ally for allowing its Blut to be broken so easily. However, with Äs' comrade soon disabled, Byakuya unleashes his Bankai, Senbonzakura Kageyoshi, only for it to be stolen by Äs' unnamed device. Fear Manipulation: Despite their considerable attack strength, the true power of these "arrows" lies not in their offensive capability, but instead in their ability to induce limitless fear in those who are struck. Just a single wound is enough to inspire a deep-seated fear towards Äs, causing victims to doubt everything and lose control of all rational thought. While this would typically result in instantaneous death, a person's heart being unable to bear such intense shock, an individual's experience and willpower can be used to resist this fear to an extent, although Äs is confident that all would succumb to it eventually.